Grounds for Empowerment farmer Ivania Calderón poses with her team on her farm on Kilambé Mountain in Nicaragua. 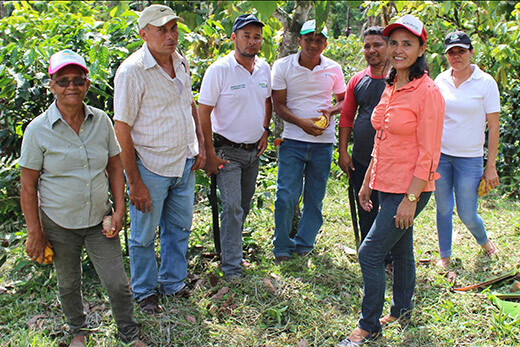 Grounds for Empowerment — a Social Enterprise @ Goizueta initiative — is partnering with Nicaragua’s Vega Coffee to provide even more economic opportunities for women coffee specialty coffee farmers. GFE coffee will be grown, roasted and shipped from Nicaragua, allowing participating farmers even greater participation in specialty coffee value chains. The GFE program was created by Social Enterprise @ Goizueta (a research center within the Goizueta Business School at Emory University) to support female coffee farmers, initially in Nicaragua. The goal of this three-year business incubator program is to address the challenges associated with extreme isolation so that coffee market will fairly compensate women farmers. This will allow them to invest in their businesses, families and communities, strengthening the areas where they live and work. Vega Coffee is a roasting company in Esteli, Nicaragua. Founded by Rob Terenzi, Noushin Ketabi and William DeLuca, its goal is to create a more equitable and fulfilling coffee experience, connecting the world’s coffee farmers directly with the world’s coffee lovers. In the process, they have become field experts who are redefining the specialty coffee industry. Why? The global coffee industry is the primary means of support for millions of people around the world. However, too little of the $100 billion generated each year makes it back to origin. Twenty-five million coffee farmers live and work in difficult conditions and are under-compensated for their hard work. On coffee farms, women are overrepresented in most roles, but underrepresented when it comes to farm ownership and coffee sales. They make less money and have fewer opportunities than their male counterparts. As the specialty coffee segment continues to grow, the price premiums that customers are paying for excellent coffees are attractive to farmers, as long as they are given the opportunity to capture a greater share of these payments.